Well, it has to be the ball, right? Or are the goalkeepers just really bad? The Netherlands were able to get 3 points out of a dreadful match with Japan, as Wesley Sneijder’s shot somehow beat the surprised Kawashima. 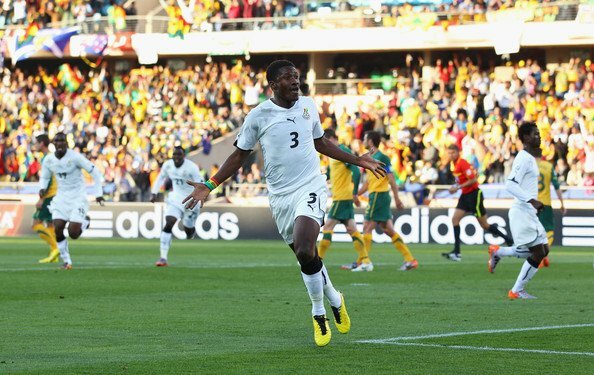 Australia stunned Ghana in the beginning of their match, as Richard Kingson couldn’t handle a free kick and Brett Holman scored off the rebound. In the Denmark Cameroon match it was just bad defending in a highly enjoyable outing, the best of the day by far and maybe the entire tournament. The Netherlands secured their place in the last 16 with their 1-0 win over Japan, but like against Denmark, they were far from convincing. Who knows, maybe this time around, lacking style and flair will work for the Dutch, still looking for their first World Cup. Mark Van Bommel was their best player today, but once the ball moved forward to Sneijder, Van der Vaart and Van Persie, the game was stuck, as they failed to create any real opportunity in the entire first half, and besides Sneijder’s goal, had to wait for two Affelay late one on one misses. Japan looked dangerous at times, but never attacked with numbers, never really making Stekelenburg work hard. Another Group D match, another red card. This time? Harry Kewell, who stopped a shot on the goal line with his hand. Although not every referee would have sent him off, Rosetti didn’t hesitate and left Australia for the second straight match with 10 men. This time, they held on, grabbing a point, staying with a mathematical chance of making the next stage. Asamoah Gyan converted his second penalty of the tournament, while Brett Holman became Australia’s younger scorer in their World Cup history (26), with another huge keeper mistake. Ghana looked very shaky in the beginning, but took over the match after conceding, and only a fantastic display from Schwarzer and a fighting Australian unit led by Moore and Neill rescued an Australian point. Ghana should have been less careless when attacking, as a bit more concentration should have bagged them a second win. On to Group E again – the most enjoyable match of the tournament so far in my opinion. Cameroon decided they’ll play like people expect from African teams – creative and wild attacking while forgetting about defending. Denmark? They just have a bad defense. Cameroon opened blitzing on Sorensen’s goal, with the “veteran revolution” looked like it’ll fix things for Cameroon and Le Guen, who, rumor has it, let Eto’o decide who will start. For the first 10 minutes, it looked great, as Eto’o scored after a terrible mistake in the Danish back line. But Denmark were here to play, not stay behind like against the Netherlands. Dennis Rommedahl gave what was probably his finest performance in for the national team, leading the aging Danish attack by setting up Bentdner’s goal and scoring a fantastic curling shot with his left in the second half. Cameroon had plenty of chances and so did Denmark, in a match that produced 36 shots, including 12 on goal. Sorensen was too good, while Eto’o, Emana, Webo and Idrissou just couldn’t finish well. Cameroon are now out, while Denmark need to beat Japan in order to advance. Netherlands – They need Robben. They need speed. I never liked Van der Vaart’s pairing with Sneijder, too much of the same thing. Sneijder is better, Rafael should sit, and Elia or a healthy Robben should start. Plus, Van Persie should switch with Kuyt, or let Huntelaar start and move Van Persie to the wing. On the other hand, 2 wins, despite the lack of falir. Japan – Shouldn’t be afraid of attacking. Okubo, Matsui and Honda make a very dangerous trio, but not enough players join them. Denmark are coming in confident, and Japan, despite defending very well, need a bit more offense to prove they’re worthy of the last 16. Ghana – Kevin-Prince Boateng looks very comfortable in the middle, and Asamoah Gyan has moments when he looks like a World Class striker. Still, most of the time, Ghana just lack discipline and concentration on offense. You need more than penalties to go through, and Germany won’t get screwed by an official two times in a row. Australia – Fighting spirit? Check. Chances? None. Denmark – Dennis Rommedahl was excellent, and Bentdner played a very good match as well. The defense is very shaky, but Sorensen seems to be in good form. Denmark need Agger and Kjaer to have better games. Japan won’t necessarily be as forgiving with their chances and there’s no doubt they’ll be much more careful on defense. Cameroon – Despite returning to a very entertaining style, didn’t have enough to see their early lead through. Paul Le Guen, if the rumors about losing the dressing room to Eto’o and the veterans, should take a long long break from managing. Slovakia – Paraguay – Both teams, well all teams in Group F are after a 1-1 draw. Slovakia showed some nice football, especially from Weiss and Stesak against New Zealand, but Paraguay are a different story. Like in the previous matches, Slovakia will probably enjoy most of the possession while Paraguay will cautiously try to score and hang back. Italy – New Zealand – Italy looked much better in the second half against Paraguay, but won’t have an easy time against the very physical All-Whites, who won’t try to attack very often. Lippi needs some speed and flanks, otherwise, it’ll be a very long afternoon for Italian fans. Brazil – Ivory Coast – I don’t think there’s a match that Brazil don’t walk into without being the favorites, and it’s the same story here. Drogba will start, and unfortunately for the Ivorians, they really need a win here – it’ll be very hard to get even a point. Final Words – 49 Goals, 26 Matches. We’re nearly there.